Slum Soccer is an organisation based out of Bokhara, Nagpur, Maharashtra which uses football to bridge the gap between people divided by economic barriers in India. Jhoparrpatti football as it began to be called back then, roped in youngsters coming from backgrounds of drug abuse, anti-social activities, conflicts and personal struggles. 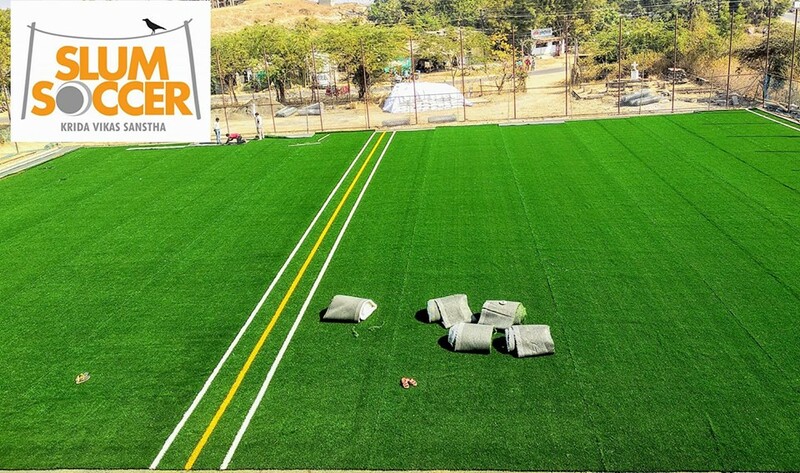 Founded by Vijay Barse and Abhijeet Barse the NGO particularly known as Krida Vikas Sanstha in this part of India has yet another feather in its cap by setting up a state of the art Astroturf football pitch at their facility in Bokhara! 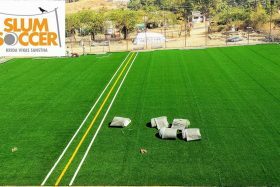 The newly installed Astroturf pitch at the Slum Soccer venue is one of a kind, commonly known as the Astroturf 3DX 52 surface comes along with the latest Root zone technology system and has been set up on a 14,000 sq.ft area. It can be used as one playing field (140ftx100ft) or two small playing fields each (100ftx70ft). There are two types of synthetic material making up this Astroturf pitch. It has a secondary layer of nylon fibre, it helps trap and hold in place the infill (small granules of rubber made from rubber tyres). The primary layer, the longer grass is a slit film polyethylene fibre which takes the major wear and tear of the rubber soled or rubber studded sports shoes. The life of this pitch is about 8 to 10 years if taken care by following proper Astroturf maintenance guidelines. The best part about the pitch is that it hardly requires any water which is an added advantage for a place like Nagpur where temperatures during the summer can reach as high as 40 degrees Celsius. The organisation now offers the joy and pleasure of playing football to FIFA specified standards right at their headquarters. The turf is also being referred to as the “Diversity Pitch” as some of the funding made available for its set up comes from Slum Soccer having won the FIFA Diversity Award less than two years ago. Astroturf sent its turf experts and engineers to work in tandem with Anglian Sports Management Group (Astroturf Partners) who followed all the guidelines mentioned by them in laying the turf.